Lift or lower your sled in one easy step. Great for storage, maintenance and extending track life. Rust-proof aluminum. 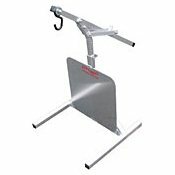 Lifts regular and long track sleds. Made in the USA.